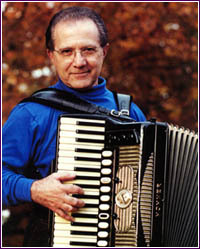 Joe Soprani is a noted accordionist, educator, arranger-composer whose reputation among professionals places him in the first ranks of contemporary accordionist. He has dominated the accordion scene in Philadelphia for over forty years playing in major concert halls, theatres, TV Shows and Hotels. He holds the distinction of being the only accordionist in the history of the Philadelphia Orchestra to appear as a featured soloist under Eugene Ormandy. While accordion soloist with the USAF Band in Washington, DC under Col. George S. Howard, he won the "The Air Force Roger", the most prestigious entertainment award in the US Air Force. He also was the first accordion soloist with the PA Army National Guard Band "The Adjutant General's Own" for over eight years. On five occasions, Soprani appeared with opera singer Luciano Pavarotti at the Spectrum in Philadelphia and has performed for President Eisenhower at the White House. To add to his impressive list of credentials, Soprani was invited to arrange the opening selection for Rock star Jon Bon Jovi's 1996 world tour and has also written the official song for the International Rotary Club. In addition to performing in Broadway shows such as "Fiddler on the Roof", "Zorba", "Cabaret" and "Erma la Duce", he has performed in world premieres of "Frida", a musical that called for a virtuoso accordionist and "Another Kind of Hero", a musical which featured Soprani on stage for an entire scene. Soprani, who appeared on the Ed Sullivan Show and won the Arthur Godfrey Show, appeared with TV Star Nell Carter in a "Colors of Freedom" Production at the Convention Center in Philadelphia in 1995. He also appeared with Peter Nero and the Philly Pops playing a special arrangement by Nero with Soprano Evelyn de LaRosa. In November of 1997, Soprani became the first accordionist to perform in "La Traviata" by Verdi presented by the Opera Company of Philadelphia, at the Academy of Music in Philadelphia. Klaus Arp, the opera conductor from Germany, decided to use the accordion in the small ensemble on stage during "La Banda" sections.